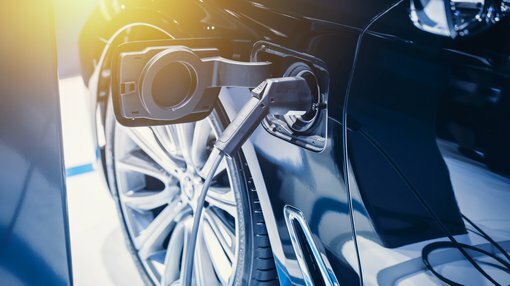 Yesterday we highlighted the extensive multi-sector activity that will be generated by the emergence of electric vehicles (EV) and self-drive vehicles (SDV). While there is much hype surrounding battery minerals, it could be argued that the billions of dollars being invested by technology companies aiming to develop the best intellectual property for components that extend beyond the basic battery warrants just as much if not more attention. Alphabet Inc’s wholly owned subsidiary, Waymo, has been one of the most active players in terms of investing in research and development in this area. It should be noted that any investment in Alphabet based on Waymo’s R&D would be speculative, so investors should seek professional financial advice if considering this stock for their portfolio. Demonstrating its commitment to not just being the first to deliver the technology, but also being the best so that it can dominate a niche fast growing market, Waymo has even built a city with roads, buildings and houses where it tests the cars. 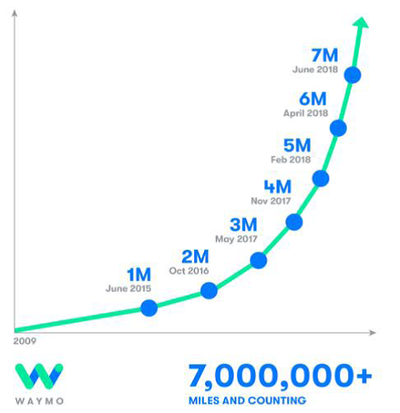 Waymo drives more than 25,000 autonomous miles each week, mainly in urban areas and the group’s software also completed 2.7 billion simulated miles in 2017. Analysts have noted that the one million mile updates have increased in regularity, suggesting an accelerated growth rate as seen in the chart below produced by the company. In 2018, Waymo partnered with Jaguar to create the world's first premium electric self-driving vehicle: the Jaguar I-PACE. Testing starts this year and Waymo will add up to 20,000 I-PACEs to its fleet in the next few years, enough to drive about a million trips in a typical day. On July 10, 2018, Mark Mahaney, analyst at RBC Capital Markets said, “We believe the commercialisation of Waymo by year-end in Phoenix could be a catalyst in the near-/medium-term, leading to a potential rerating in Alphabet Inc’s (NASDAQ:GOOGL) multiple. “Our two long-term monetization scenarios for Waymo, developed with RBC’s Auto Analyst Joe Spak, generate potential enterprise values of US$119 billion to US$180 billion. The following shows GOOGL’s share price performance over the last 12 months with the company hitting an all-time high of just over US$1200 per share, but more recently hovering in the vicinity of US$1170 per share. Step back five years and GOOGL was trading just above US$400 per share – the subsequent three-fold gain can be attributed mainly to its technological expertise, and if it continues to deliver on that front the company could well lead the way in providing components for the new age automotive industry. Under the first scenario, RBC believes Waymo will buy vehicles from original equipment manufacturers (OEMs) and outfit the custom vehicles with its autonomous driving technology and become its own transportation network company. By 2030, a potential circa 1.5 million Waymo vehicles could account for 1.5% of total new vehicles on global roads. The key financial points revolve around the generation of US$1.9 billion in annual revenue with an annual operating loss of US$1 billion by 2022 and US$65 billion in annual revenue with an annual operating profit of US$20 billion by 2030. Under this scenario, RBC estimates that Waymo could achieve breakeven operational income in 2025. Under the other scenario, RBC assumes Waymo will license its self-driving operating system (SDOS) to OEMs in the form of a recurring, yearly software subscription. Under this scenario Waymo is forecast to grow its penetration from 25 per cent to 34 per cent of the new autonomous vehicle market over circa 10 years, assuming other OEMs and tech companies take the remaining market share. The key financial points are that RBC believes that Waymo will be able to generate US$736 million in annual revenue with an annual operating profit of US$250 million by 2022 under this scenario, increasing to US$53 billion in annual revenue with an annual operating profit of US$35 billion by 2030. For this scenario, the broker built in a discounted cash flow (DCF) and assigned an exit multiple of 15x earnings before interest, tax, depreciation and amortisation (EBITDA), deriving an enterprise value of US$180 billion. Given that this model is less capital intensive and higher margin, RBC assumes this would be GOOGL’s preferred monetisation strategy. Whichever way you look at it, this is big bucks so if GOOGL can get it right it would have a material impact on the value of the Global X’s Autonomous & Electric Vehicles ETF.